The last paragraph of the version that appeared in the Souvenir program for the 53rd seminary day and 10th alumni homecoming of St. Pius X Seminary lacks a sentence. He was born on March 2, two years after his parents were married. He was two years old when Bataan was bombed and his father perished with many others in 1942. He held two positions, as prefect of discipline and as rector, in his more than 20 years of service in the seminary. He is a member of two religious groups, the Flock of Devine Mercy and Holy Trinity Divine Ministry, and he believes there are two simple ways to become a saint. For this article, we talked with him for more than two hours. We printed and had two copies of the same sets of question guides. With me was St. Francis Xavier class batch 2001 salutatorian whose first name is the combination of two Holiest names in Christianity, Jesus Maria Quintia, my classmate, photographer, and videographer for this interview. 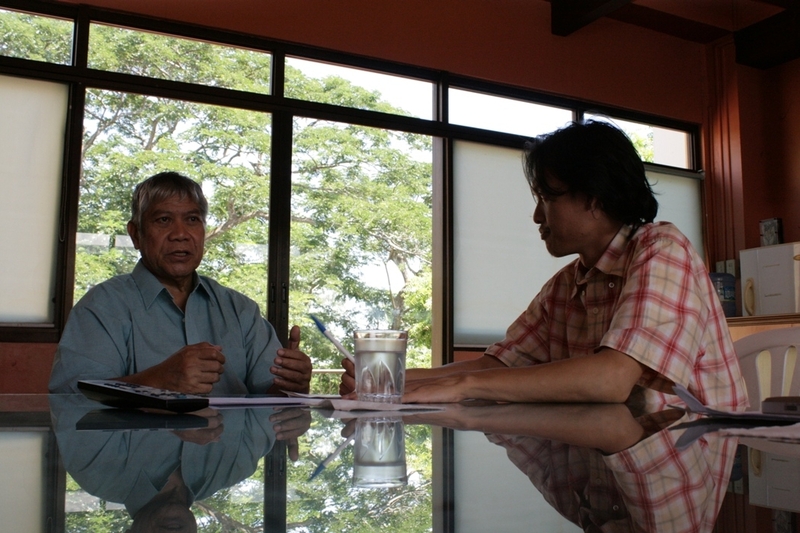 The video camera ran out of tape and the micro recorder refused to function for the interview with Monsignor Daniel Viloria as a tribute to the 52nd Grand Alumni Homecoming of St. Pius X Seminary (SPXS) on the 21st day of August 2009. In order to explain the difference between seminary life in the past with the present, Monsignor Dan needed to divide the existence of SPXS into pre-Vatican to Vatican and from Vatican to post-Vatican periods. The first period from 1967, the year SPXS started operations, up to 1970 was a period characterized by what he called the medieval rule. The next 25 years of SPXS the rules were relaxed little by little until today, such that Monsignor Dan thinks the rules have been relaxed too much, and values are eroding. The seminarians of today, for example, drink coffee in coffee shops wearing their uniform. Before when seminarians drink coffee in coffee shops wearing their uniform, they did it discreetly such that it was almost impossible to catch a seminarian in uniform in a coffee shop drinking coffee. Now, seminarians seem to flaunt their uniforms in public places such as coffee shops, and coffee shops that sell expensive coffee at that. The coffee shop example talked about prudence. Since benefactors pay for their tuition, seminarians must avoid the appearance of imprudence and indiscretion. Benefactors might also be encouraged to buy themselves coffee or other luxurious items instead of saving and allotting the money for funds to help the seminary. There is a rumor that Monsignor Dan is a karate black belt holder. False. Monsignor Dan hinted though that he used to have a karate belt in recognition of his efforts as a karate student. But because he has long purged himself of violence, what remains on his waist now is the belt of chastity and the ones he used to stop his pants from falling down. Yes, he is still a fan of boxing in so far as he wants to know who wins or loses. But he no longer enjoys the idea that one has to physically punish another to win. So, when Manny “Pacman” Pacquiao fought Ricky “The Hitman” Hatton and knocked him out cold in the second round of their fight tagged as “the battle of the East and the West” on May 3, 2009, Monsignor Dan did not watch the fight live. He watched the replays to observe the style and to find out the improvement each fighter achieved compared to their previous fights. Asked to compare Pacquiao with (Muhammad) Ali, each has his own style, Monsignor observed. 2. By doing everything for the Glory of God, which means never ever removing God in our consciousness for the rest of our waking and non-waking hours. Only through that, can we offer everything, literally everything, we do to Him. Before the interview, Monsignor prayed over us. He absolved each of us of our sins and handed each of us a chaplet of the three o’clock prayer for the Divine Mercy. After that, he said a prayer in preparation for the interview. After the prayer, he reminded us to always pray so that God will guide our every decision in life. He then told the story of David who arranged for his general to die in battle so that David can have the general’s wife. David had a wife too many. Why take someone else’s? Monsignor was talking about greed. He warned us about greed. He reminded us never to be greedy. Remember, my son, Monsignor said, nobody who has ever taken what is not his has been favored in the eyes of God. David was eventually forgiven, but as a punishment, his descendants bore the burden of his sins. Life inside the seminary is about discovering the nobility of the human spirit, the immortality of the soul, and finally of getting to heaven. A life’s occupation that goes beyond the concerns of basic existence, and deserved by the few chosen among the many who were called. Behind the seminary walls is a life of eking out a living, where greed is rewarded with better food, better clothes, bigger house, and powerful companions, and where only the poor, hungry, and oppressed seem to think of and long for heaven, a place where they would finally find solace. The two steps to become a saint, the reminder about prudence and against greed from a man who must live alone but whose life, it seems, revolves around the number 2, comes handy. After all, we are not ordinary civilians. We are Pians. This entry was tagged Daniel Viloria, msgr Dan, pian, St. Pius X Seminary. Bookmark the permalink. Does anyone know if Monsignor Daniel Viloria has an email address or website at the Seminary of St. Pius X, in Roxas City, in the Philippines, so that i can message him and get a quick response? Thank you in advance and God Bless you. Thank you for this beautiful and inspiring article. Msgr. Dan deserves all our gratitude and I’m sure, through the years, his words of wisdom will still have great influence in our daily lives. Great Job Bolano JP, keep it up! Magaling. Please, tell him I named one of my children after his character. Mickey A and I could not talk about the good old days at spx without mentioning “Fr. Dan”. Also, i always have my rosary and his voice of reminders in my pocket. this is good stuff! good job jp. i am a proud pian. Reading this article brought me back to my seminary days with Msgr. Dan as overall father. Tnx, bro!